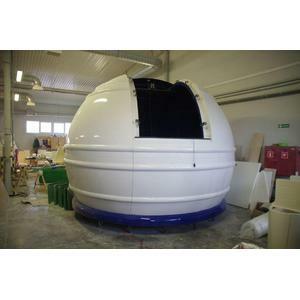 This Omegon observatory is identical to the corresponding ScopeDome model. The dome is made from polyester–glass laminate of up to 6 mm thickness, providing full resistance to weather conditions, and ensuring high durability and aesthetics at the same time. In addition, it is reinforced by special convex profiles on the outside of the mazer and reinforcements placed inside the structure. The dome is made up of 8 basic elements – it strongly facilitates transport and the assembly on the high buildings. The tightness of the dome is guaranteed by its special construction which also prevents the leaking of water inside. The large gap at the base and the bright color covering prevent over-heating. Large window of one meter width the edge of sphere allows freely observations using telescopes of up to 120cm diameter. Observation window is designed so that the telescope had clear view of the zenith. Rotation of the dome is provided by a base placed track, it rolls thanks to 16 plastic rollers system. Driving system of the dome is made of two silent low power engines supplied from the 230V. One controls the dome’s rotation, the second allows you to open and close observation window. Special encoder mounted on a circuit of the dome cooperates with the dedicated driver which constantly measures the location of the dome and adjusts the engines’ work respectively to the position of the telecope.